animal activism developments and significant science news. Note: This week’s edition of AMPNews is coming to you one day early due to the holiday. The animal rights group Direct Action Everywhere is having a very busy week. 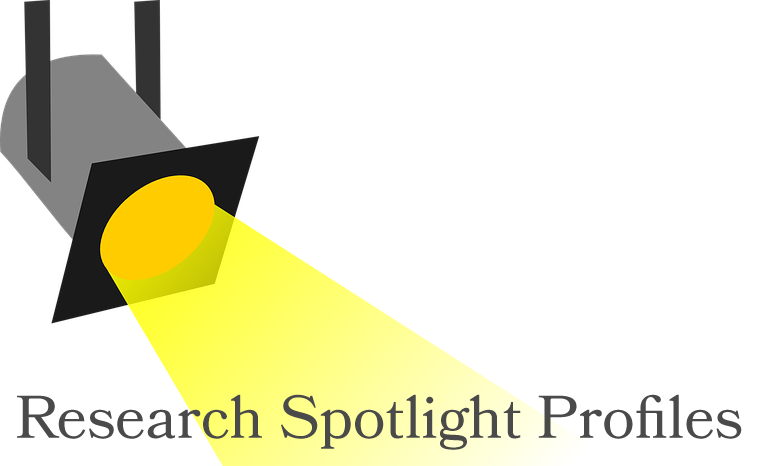 The organization, which mainly focuses on farming, but sometimes targets research-affiliated businesses, is holding a series of events both before and after the Thanksgiving holiday. Media reports claim that over 400 DXE-inspired activists marched in a Salt Lake City protest last weekend. The group wants legal charges dropped against more than 60 people involved in “open rescues” in California and Utah, where activists have entered private property and taken animals. The march was one of many events being held in conjunction with the Animal Liberation Western Convergence, a conference hosted by Direct Action Everywhere. PETA co-founder Ingrid Newkirk was on hand for the march. At one point, some activists entered and protested inside a Whole Foods store. Both the grocery store chain and Amazon.com, which purchased Whole Foods last year, are current targets of the group. One Utah farmer, likely surprised many in the agricultural community this week by co-hosting an event with DXE. Rick Pitman, the owner of Norbest farms and DXE founder Wyane Hsiung, were on hand as 100 turkeys from Norbest were given to activists to take to sanctuaries. One participant appeared to have driven all the way from Oregon to transport animals. While Pitman’s farm was targeted by the group in the past, he claims he does not support felony charges against the activists, leading to the “compromise” with Hsiung. Another PETA-affiliated celebrity appeared at this event. 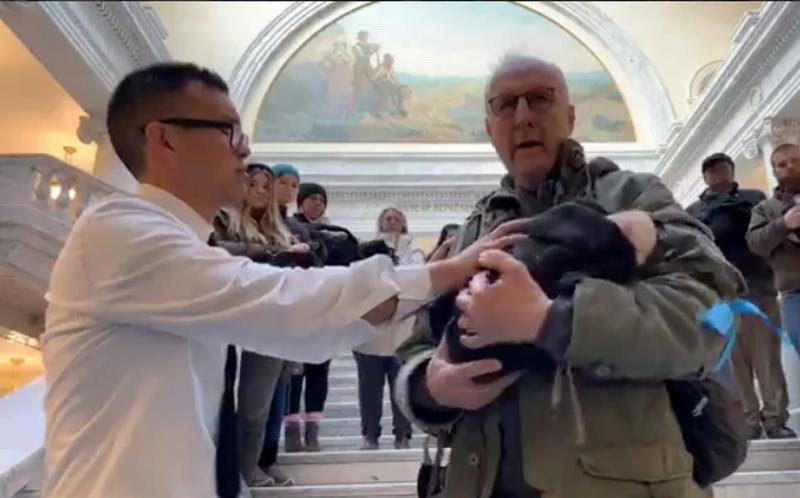 A video provided by DXE shows that longtime animal activist and actor James Cromwell was in attendance. DXE also held a demonstration at the Utah State Capitol on Tuesday. Members showed up with pig carcasses in their arms to protest animal farming practices within the state. Again, James Cromwell made an appearance. He also made comments to the press. 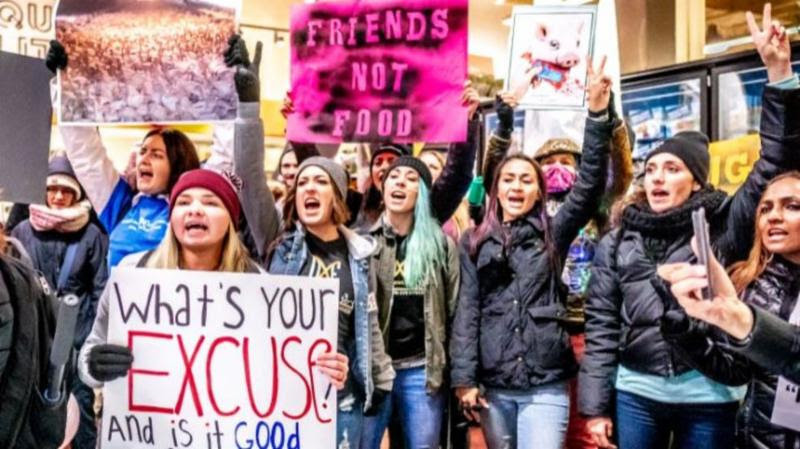 Insights: While the increased coordination and collaboration between DXE and PETA might come as a surprise to some, there have been several instances in the past where PETA has associated itself with some of the more extreme voices in the movement. Ingrid Newkirk has made statements supportive of the Animal Liberation Front. Newkirk has also been accused of having advance knowledge of one ALF action. Years ago, a U.S. Attorney shared his belief that Newkirk coordinated with Rodney Coronado to receive documents stolen from Michigan State University prior to his 1992 arson attack on the institution. Direct Action Everywhere organizers say that additional events are planned worldwide this upcoming weekend. Following VA Secretary Robert Wilkie’s surprise announcement stating his support for canine studies at his agency, White Coat Waste Project continues to respond. An opinion piece by Patrice Green, M.D., J.D., appeared in the Independent Journal Review, a conservative news and opinion website. The article’s praise of White Coat Waste and the WCW’s proposed Pupper’s Act, clearly hint that the article was a collaborative effort between the author and the group. WCW is also involved in efforts to pit two federal agencies against one another. On November 16, FDA Commissioner Scott Gottlieb, M.D., announced efforts to reduce animal testing through a study aimed at eliminating the use of dogs in certain trials. 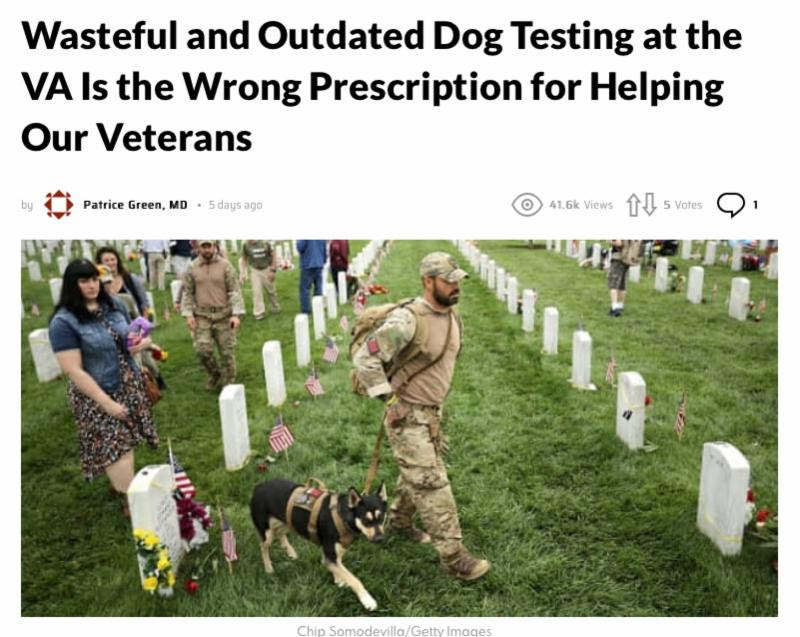 That news was followed very quickly by an article in Business Insider titled “The FDA is taking steps to reduce testing on dogs while the VA doubles down on its harmful experiments.” WCW’s Justin Goodman is quoted in that article. 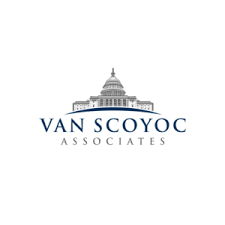 Insights: Another opinion article critical of the VA’s research, appeared this past weekend in the Pittsburgh Post-Gazette. Americans for Medical Progress quickly responded to that editorial and we hope to see our response published. After Rescue + Freedom Project’s new Rescue and Outreach Center was destroyed by the California wildfires, the group is already raising funds to replace it. 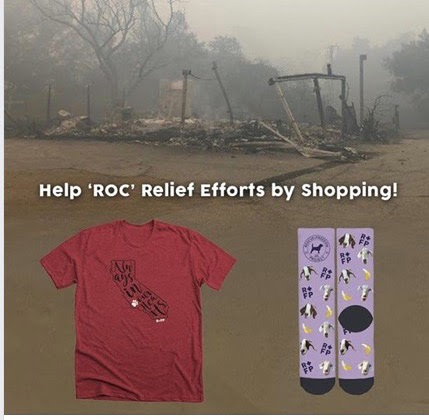 RFP is selling socks and T-shirts via its social media feeds. The group has released limited information about the fire on its Facebook site but says animals previously housed in the building are now temporarily living in private homes. Several stories have appeared in the media regarding a group of about 300 wild monkeys living in Silver Springs State Park, south of Gainesville, Florida. A recent report suggests that the monkey population will double by 2022, unless state authorities step in. Reports claim that some of the animals, vervet monkeys, came from a lab in the 1950’s. Local residents are concerned about the threat of exposure to the herpes B virus, which approximately 30 percent of the animals are said to carry. Officials at the Rapid City Regional Airport in South Dakota are on defense regarding ads purchased and placed in their terminal by PETA. 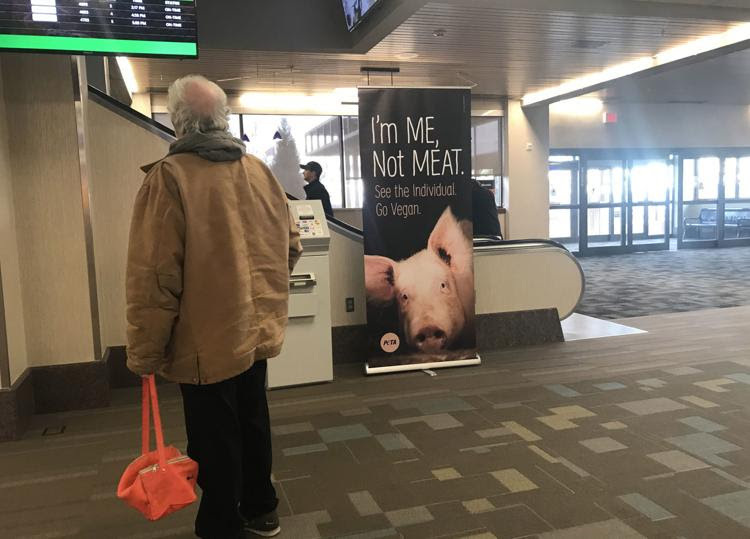 Six banners featuring a pig or turkey with the phrase “I’m me, not meat” appeared in the airport on Friday. The South Dakota Stock Growers Association and other critics have complained. Airport officials have responded by citing their equal opportunity ad policy. PETA has launched an email campaign against Colorado State University’s West Nile virus research in birds. Stop Animal Exploitation Now is criticizing the University of Alabama at Birmingham after the institution self-reported an incident during a multiple sclerosis study where two mice apparently exhibited paralysis in their rear legs. We have included Facebook links, when possible, with additional information. DxE actions planned around the world. NY Farm Animal Save protest. Jane Velez-Mitchell and PETA president Ingrid Newkirk appear in Palm Springs as part as Newkirk’s “We Are All Animals” speaking tour.